Fiction by Michelle Ann King: 'Tis More Blessed - Giveaways Galore! 'Tis More Blessed - Giveaways Galore! 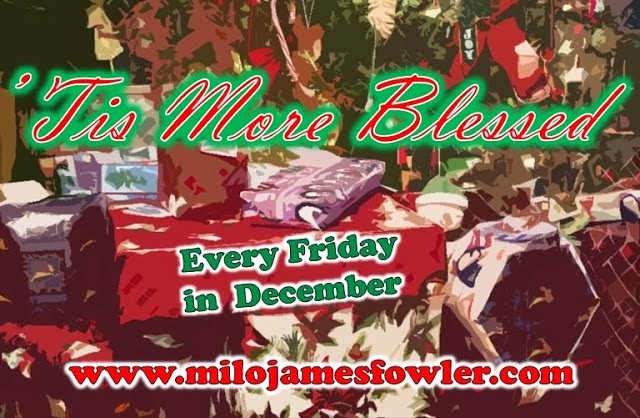 Today is the first week of 'Tis More Blessed - a month of glorious giveaways organised by Milo James Fowler! There's a full list of participants below, and Milo has a list of today's offers on his blog. I'm giving away a copy of my collection Transient Tales Volume 2 - 12 stories of science fiction, fantasy and horror featuring features a Halloween game with a chilling price, a call-centre at the end of the world, an unconventional quest for a portal to fairyland, a mother dealing with the loss--and the return--of a child, a desperate woman’s letter to her future self, a repentant scientist’s lament, an envious boy who gets more than he bargained for, and a misguided attempt to gain closure on a very dead love affair. Getting a copy is very easy - all you have to do is drop me a blog/Facebook comment or a tweet recommending one of your favourite short stories. Then feel free to help yourself to an ebook in the format of your choice from Smashwords, with code WZ35H and the compliments of the season! Thanks for another great collection of tales, Michelle! Favorite short, eh? Does "The Lottery" count? My friend Susan Lanigan has written some great short stories, but I think my favourite of her recent ones is 'Those Little Slices of Death' (http://dailysciencefiction.com/science-fiction/biotech/susan-lanigan/those-little-slices-of-death). Thanks Michelle. I'm looking forward to reading more of your work. As for favorite shorts, they're the Goofy ones in my second drawer... oh, wait. Would you believe The Raging, Melting Space Between by Christopher Allen http://apocryphaandabstractions.wordpress.com/?s=christopher+allen My faves change daily. This one is what came to mind today. I never tire of reading or listening to LeFanu's "Carmilla," although it's probably a novella rather than a short story.